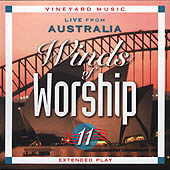 I was first introduced to Vineyard music through this CD. I was overtaken by the flat out incredible sound of the recording. The call for women to lead worship is exhibited by this album. A huge portion of it is lead by Australian worship leader Rae-Helen Fisenden of the Churchlands Vineyard in Western Australia. Indeed, she does an extremely super job in leading the congregation in worship to the Lord. With songs such as Everything is in Your Hands, More Love, More Power, and her own First Love, the passion in her voice alone calls us to worship. Brent Helming leads two songs on the album, they are Great is the Lord on High and Exalt the Lord. While the first song is a praise song, and the second a worship song, they are both reverent love songs to our Lord. Brents voice is extremely pleasant to listen to, Im sure it will minister to you as it has to me. The last song on the album, Receive Our Praise, is lead by Andy Park. Okay. Everybody go OOHHH ... AAAHHH His ability to worship freely while leading is definitely a blessing to everyone. I encourage you all to buy this album. While it doesnt have the huge sound that Winds of Worship #5 or #3 have, the Spirit of God was definitely at those meetings!